The US House passed the DARK Act! 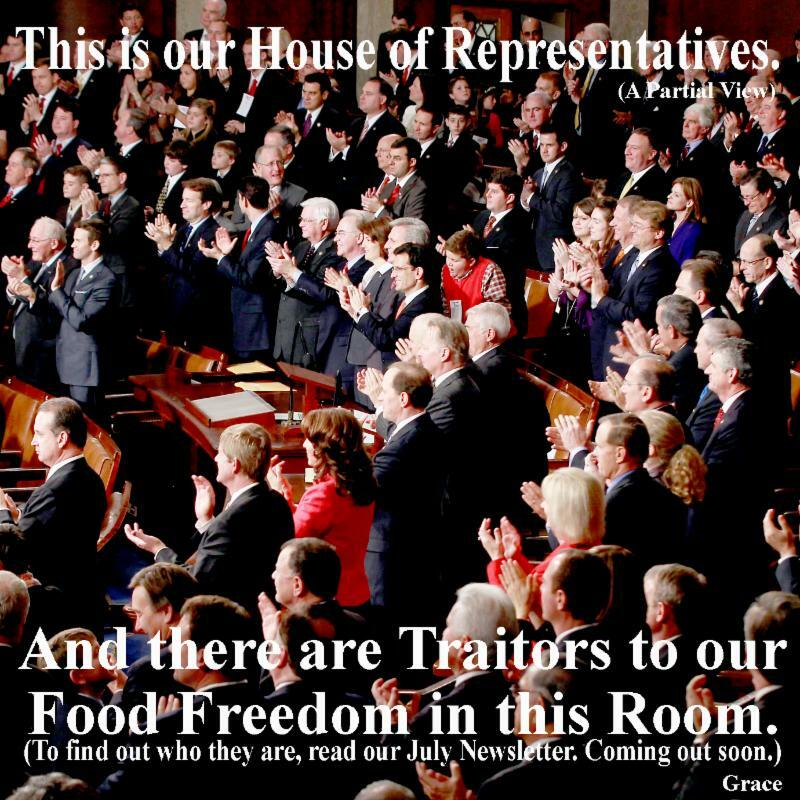 There are Traitors to our Food Freedom in the House! How did our Food System get over taken? Last Month, June 2015, I talked about how we bit off a big chunk when we started this Series on Obesity in America. Well, we’re still chewing on it. This July Newsletter, which focuses exclusively on GMO’s, is a humdinger; and it took so long to write that we’re barely making our July deadline, which is this last day of the month. This one was definitely worth the wait. Stay tuned, there’s a Part 5 on Obesity in America coming in August, hopefully not on the last day. Get Links to all of our 2014 Newsletters from ourDecember 2014 Edition. This is also the Newsletter where Obesity in America, Part 1 Starts. Here they are all in one place. Our first year of Newsletters full of incredible information about Aquaponics and our Food System. Here’s our June Newsletter, in case you missed it. It’s Part 3 of the Obesity in America Series. 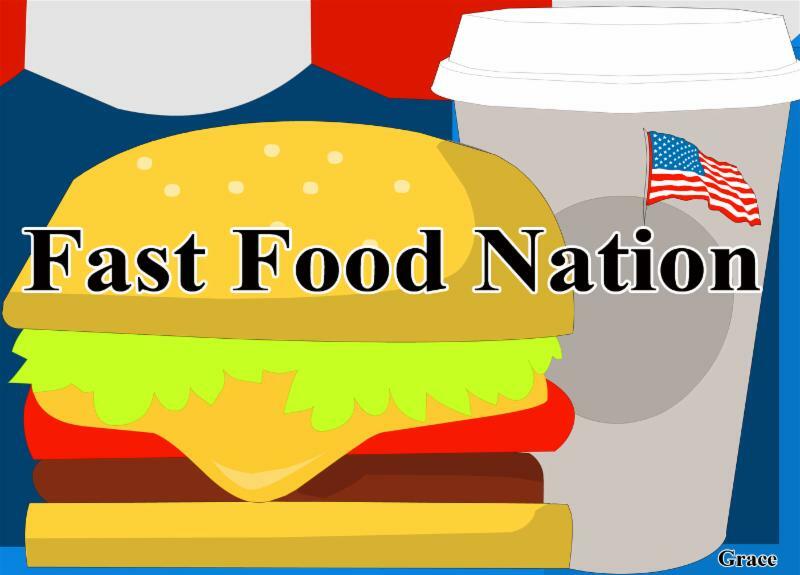 Don’t miss this important information about how our Fast Food Nation is ruining our health and our longevity. Read about the history of Fast Food, where it’s been and where it’s going. Here’s our May Newsletter in case you missed it. It’s Part 2 of the Obesity in America Series. Don’t miss this important information about High Fructose Corn Syrup. HFCS is in just about everything that’s processed and packaged. Beware, it’s as bad as alcohol for our livers. Here’s our April Newsletter in case you missed it. We declared April to be Food Revolution Month in honor of theAnnual Food Revolution Summitsponsored by John and Ocean Robbins. Then we gave the history of Earth Day in Honor of that day, April 22, 2015. Here’s ourMarch Newsletter in case you missed it. 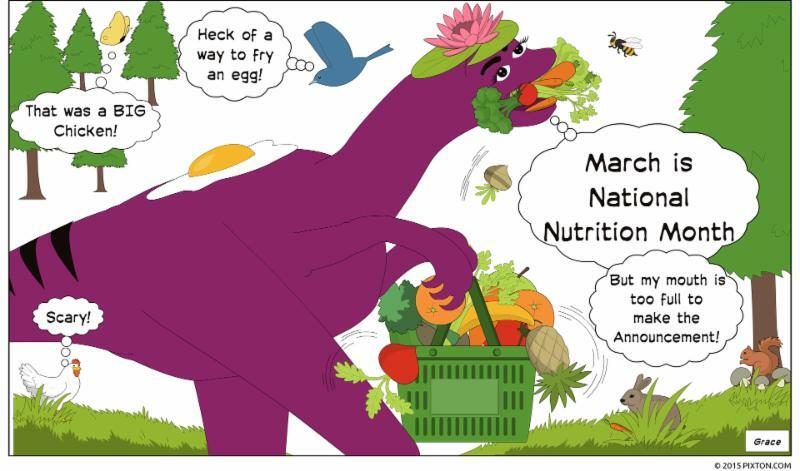 To honor National Nutrition Month, we look at all of the Food related Programs that we are running in the U.S. including who these programs serve and the costs of those services. Here’s ourFebruary Newsletter in case it was missed. 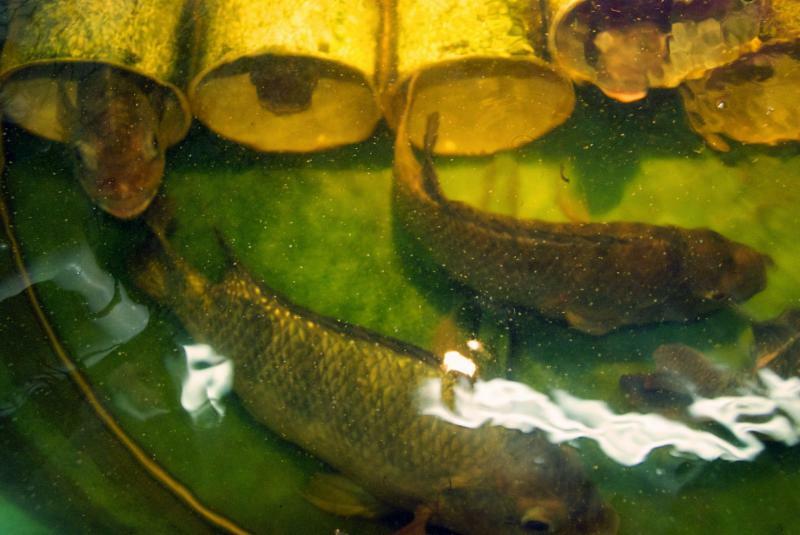 This Newsletter is all about our enclosed growing and fish raising areas, which include our Growroom and our Fishroom featuring our latest evolution in Seed Germination, the SIT (Seed Incubation Table). Here’s ourJanuary Newsletter in case it was missed. This Newsletter features our latest change in the Greenhouse, and it’s a real innovation. Our retired aerospace engineer turned Aquaponics System Designer, Oliver Duffy, just keeps improving his designs. See what he’s up to now in this informative Newsletter. Be sure to get the Ap for theAquaponics Digest Magazine! 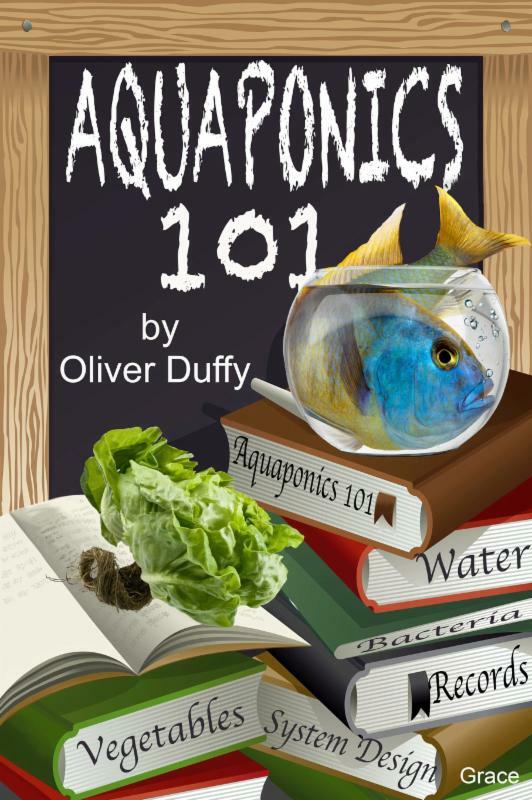 Aquaponics 101 is here and people are loving it! Get it Free on ourAquaponics USAsite. It’s full of Original Art by our Editor, Grace Sylke, including the new Pixton Cartoon designs she created for this Newsletter. It’s still in production but coming out soon. It features famous food activists like we discuss in this Newsletter including Jeffery Smith and Vandana Shiva andwe’re in it. Click theLink to Check out the Trailer. Dear Blog Subscriber and Reader: This is a reprint of our July Newsletter. 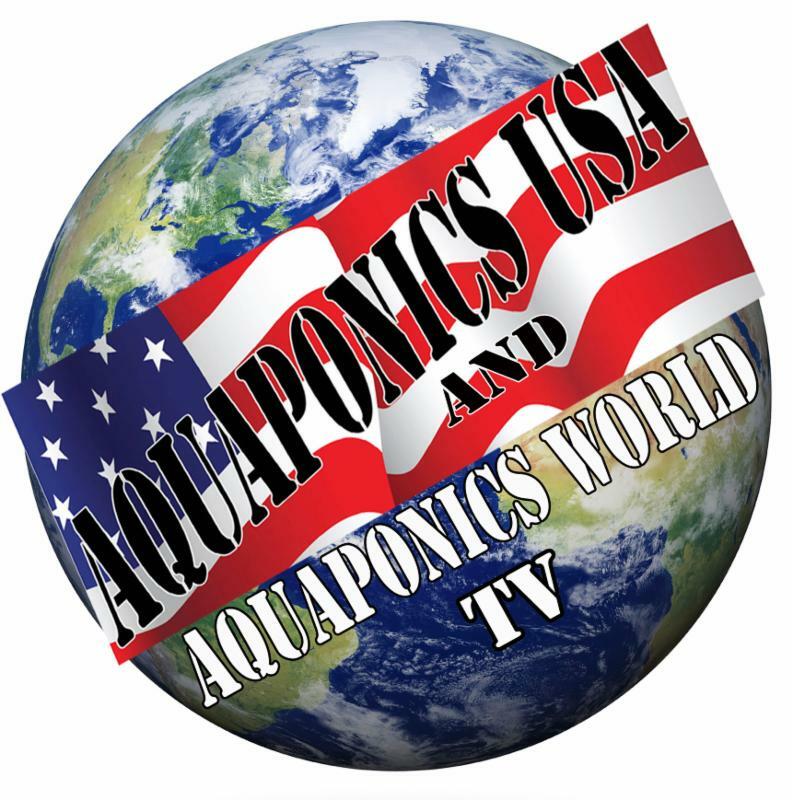 If you’d like to receive our Newsletters in your email box, just sign up on our Aquaponics USA or Aquaponics World, LLC website. Big Food has been putting toxins into their food products for years. The addition of MSG was motivated by Big Food’s perceived need to enhance the flavor of their products. Aspertame was birthed during the fat and sugar substitute food movement days; and the mistaken belief that GMO’s could feed the world brought that scourge onto the planet. Our original idea for this Newsletter was to give you a detailed look into these three food horrors including Aspertame, MSG and GMO’s describing why they are harmful to the body, who created them and where they’re hiding in the food chain. But the GMO section was too big to share the stage so there’s going to be an Obesity in America Part 5 covering Aspertame and MSG coming in August. 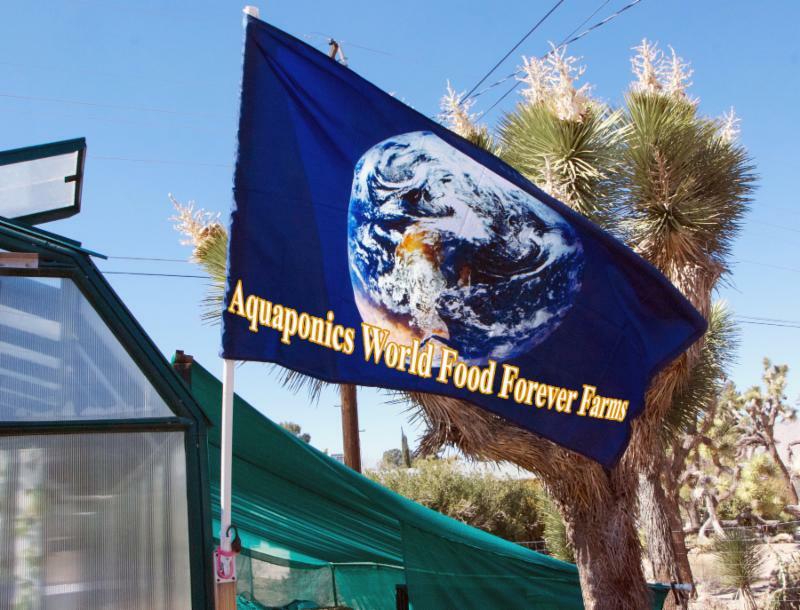 NOTE: Much of the information about Monsanto and GMO’s that you see here has been reprinted from our Aquaponics World Page called “Aquaganic”. What are GMO’s and from where do they come? The GMO story is a long convoluted one; and we can’t even begin to pretend to cover it all here; but we can give you an overview. GMO stands for genetically modified organisms; and if that isn’t enough to cause you pause, maybe the following will. In close to 50 countries, including Australia, Japan and all the countries in the European Union, there are significant restrictions or even bans on the production and sale of GMOs. 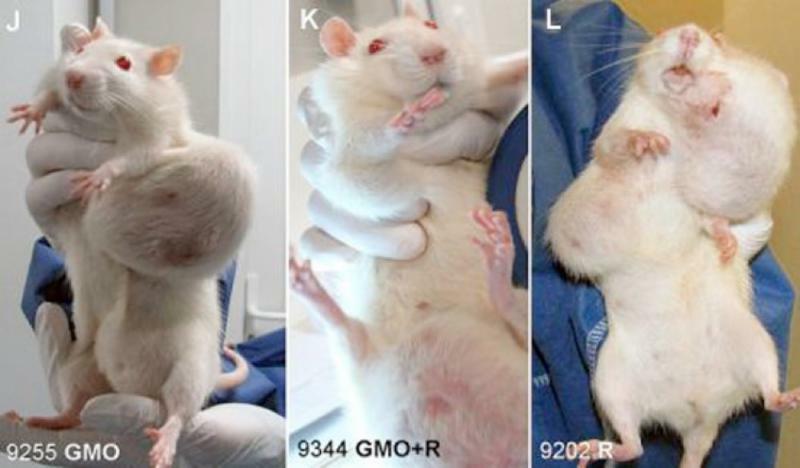 A recent study out of France showing huge tumors growing on rats fed GMO corn for their lifetime, which in the case of the females, is a much shorter one caused both Russia and France to ban GMO corn. 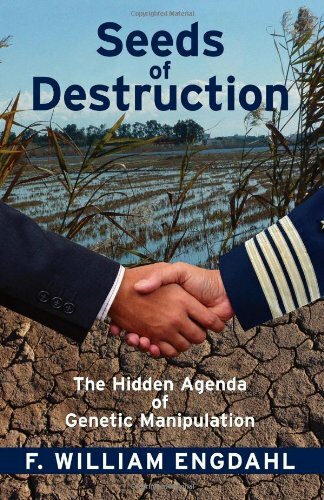 In a mind blowing review, “Food is Power”, of William Engdahl’s book entitled Seeds of Destruction, Stephen Lendman writes this about the beginnings of GMO plants. Most people believe GMOs started with Monsanto; but that is not the case. “Rockefeller Foundation funding was the Gene Revolution’s catalyst in 1985 with big aims-to learn if GMO plants were commercially feasible and if so spread them everywhere.” (To read the entire review go to theDandelion Salad Blog) Also, don’t miss William Engdahl’s book, Seeds of Destruction. We recently saw that a “Golden Rice 2” has been developed to solve the Vitamin A deficiency found in the original “Golden Rice”. Exploring the merits and problems with “Golden Rice 2” specifically is a task for another Newsletter. By this time (2000), several of the world’s major chemical companies known unaffectionately as Big Chemi had gotten wind of the huge monetary windfall possible through GMOs. Monsanto was one of those companies, along with DuPont, Sangenta and Cargill. So let’s take a close look at the leader of the GMO product and propaganda group-Monsanto. Monsanto was established in 1901 and it’s first product was saccharin. By 1955, Monsanto branched out into the petroleum business and acquired Lion Oil. With this acquisition, it was introduced to the fertilizer business. 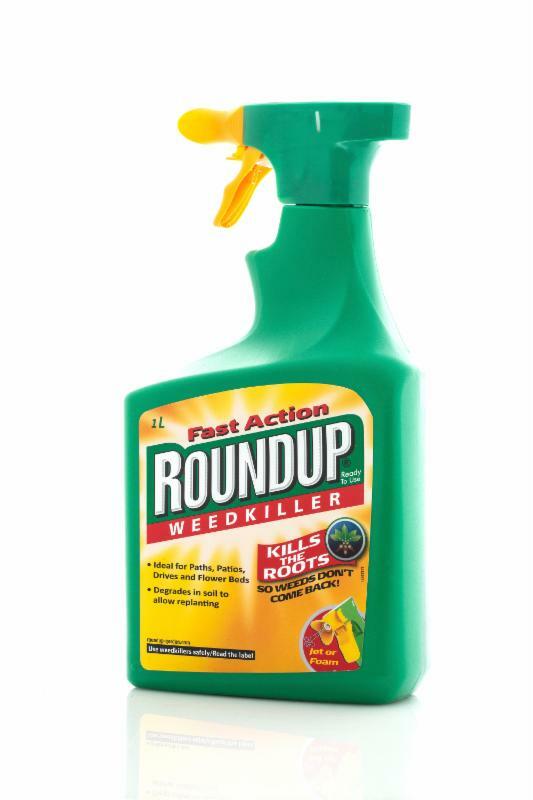 From there it moved into the agricultural chemical business with one of its leading products, a weed killer called “Round Up”, which is known worldwide. And now, as a result, no doubt, of their sterling reputation, Monsanto’s goal is to produce GMO food for the world. This company realized that they could create GMO seeds that grew plants that were resistant to their weed killer, Round Up-that same Round Up other countries are now banning. Farmers could buy these GMO seeds and use copious amounts of Round Up to kill their weeds without affecting their plants. Round Up is a Glyphosate. A Glyphosate is a poison, which is extremely deadly for most plants and quite toxic for people especially over time. It not only can get in the human bloodstream; but it can cross the blood barrier and reach our unborn children. Current Roundup Ready crops include soy, corn, canola, alfalfa, cotton, and sorghum, with wheat under development. Roundup Ready crop seeds have become known as “terminator seeds.” This is because the crops now produced from Roundup Ready seeds are sterile. Each year, farmers must purchase the most recent strain of seed from Monsanto. This means that farmers cannot reuse their best seed. These franken seeds have been patented by Monsanto; and any cross pollination onto farmer’s fields who have not purchased Monsanto seeds gets met with high paid Monsanto lawyers filing lawsuits aimed to destroy the helpless farmer who refused to get with the program. The U.S. and it’s people are in even worse shape when it comes to GMOs. 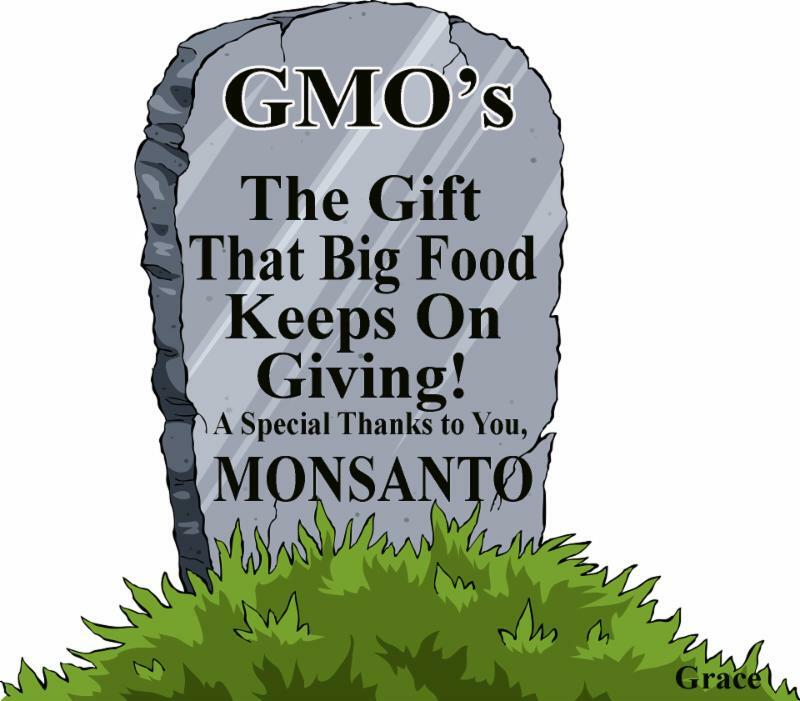 From 1996 to 2004, an astonishing 106 million acres of GMO crops were planted. This amounted to a staggering 2/3 of all GMO crops planted worldwide. And we wonder why obesity, diabetes, cancer and infertility are on the rise??? The U.S. FDA is right now under the control of an ex-Monsanto Vice President, Michael Taylor, who was appointed our Food Safety (Czar) by President Obama. Do you really think our food is safe? Under Michael Taylor’s rule you can bet mandatory labeling of GMOs will never be instituted but a lot of raw milk producers are being raided and even jailed. Guess which area Mr. Taylor oversaw for Monsanto? It was non other than that company’s milk industry products specifically it’s genetically engineered bovine growth hormone, another one of their highly questionable products. Just to make sure you get the whole picture. 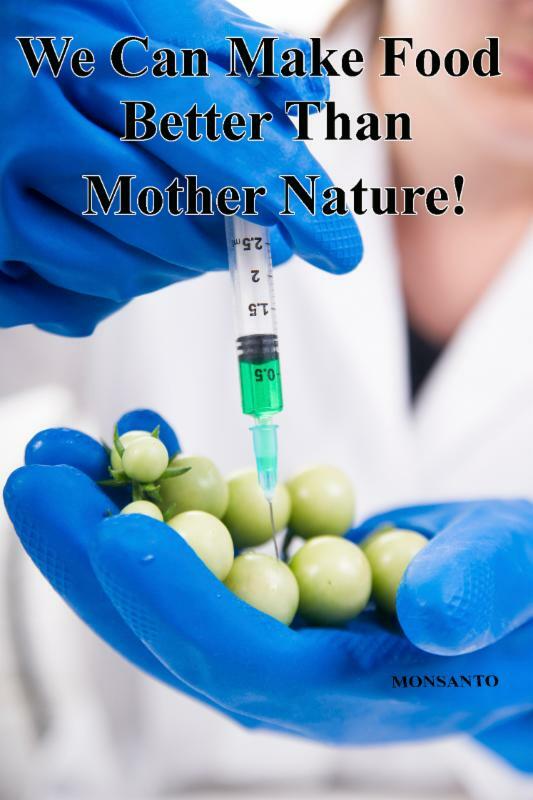 When GMOs hit the U.S. market, the FDA, under the influence of Monsanto lobbyists, declared them safe and not materially different from non-genetically modified versions of the same crops. There was no outside testing or scientific research required past what Monsanto and the other GMO pushers claim in their in-house so called scientific research. These products were unleashed into the U.S. and world market place with no required labeling either. So we don’t really know when we’re eating genetically modified products. Given the sad fact that 88 percent of corn and 94 percent of soybeans grown in America are genetically modified and many processed and packaged foods have these ingredients in them, you can bet you’re eating GMOs by the mouth full. 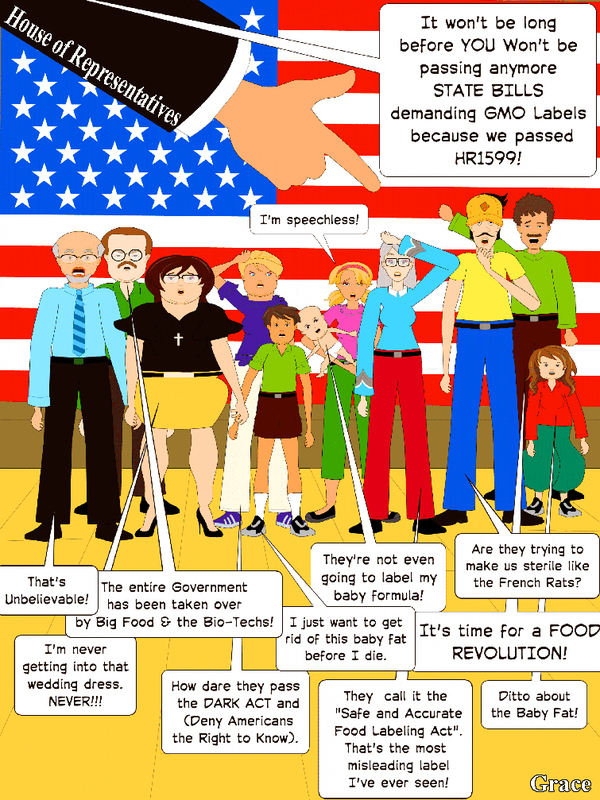 The House of Representatives takes away our right to demand GMO Labels, which is another way of saying they just gave us the shaft. Never mind the hand shaped like a gun to our heads. The Government is working hard on killing our 2nd Amendment Rights, too. 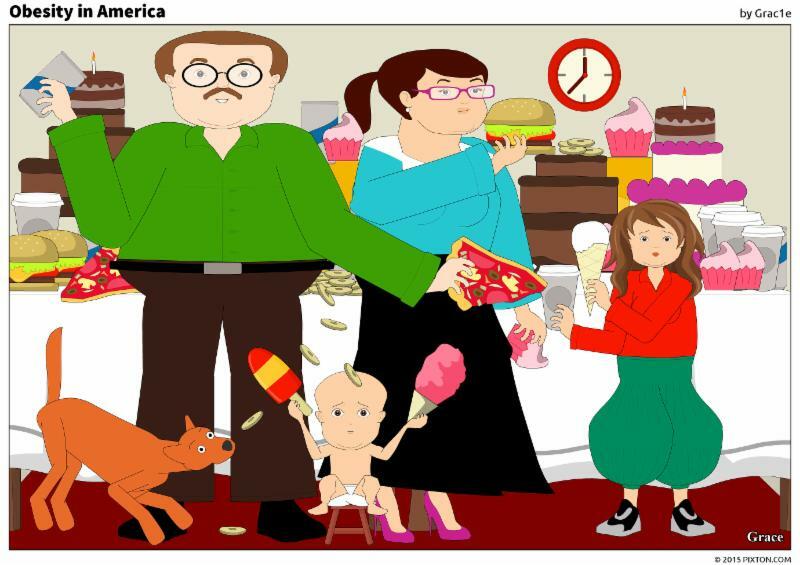 I’m feeling about as speechless as the little blond woman in my above cartoon. I had to create a cartoon out of this situation because what happened in our House of Representatives last Thursday, July 23, 2015 was historic, horrific and so sad that I had to bring some levity to it. Our U.S. House of Representatives actually voted to deny our States the right to place Demand GMO Labeling Bills on their ballots. What happened to States Rights? What happened to the 10th Amendment that states: “The powers not delegated to the United States by the Constitution, nor prohibited by it to the States, are reserved to the States respectively, or to the people”? What happened to the 275 Representatives who voted for HR1599 on that sad day? The real truth is they aren’t our Representatives-they really Represent Big Food and the Big Bio-Tech companies like Monsanto, DuPont, Cargill and Sangenta. That’s who really pays them. That’s where the money comes from to put them in office and that’s how they stay in office. It costs a lot to run a campaign in the new millenium. There are Traitors to our Food Freedom in this Room! Keep reading if you want to know who they are. …the campaigns of Reps. Collin Peterson (D-Minn.), Frank Lucas (R-Okla.), Rodney Davis(R-Ill.), Mike Conaway (R-Texas) and Kurt Schrader (D-Ore.), all cosponsors of the legislation (most of whom also sit on the House Agriculture Committee), received six-figure dollar amounts from providers of agricultural services and products – one segment of the agribusiness sector – during the 2014 election cycle. That put them high among the top 20 recipients of funds from the industry. Co-sponsors such as Reps. David Valadao (R-Calif.), Steve Fincher (R-Tenn.), Devin Nunes (R-Calif.) and Kevin Cramer (R-N.D.) aren’t on the Agriculture Committee, but nevertheless pulled in six-figure dollar amounts from the crop production and basic processing industry (another part of agribusiness; think Cargill Inc. and the National Corn Growers Association) during the midterm cycle – landing them among the 20 members who received the most from that industry. Reps. Mike Pompeo (R-Kan.) and G.K. Butterfield (D-N.C.), two original sponsors of the legislation, were the top two current House members receiving the most money from the Grocery Manufacturers Association in 2014. The grocery manufacturers – who have spent $4.1 million lobbying on all issues so far this year, almost as much as they spent in all of 2014 – have lobbied on the bill more than any other organization, mentioning the measure on 14 lobbying reports this year. If you want to get the entire List of who voted AYE and who voted NO, go to GovTrack.US. 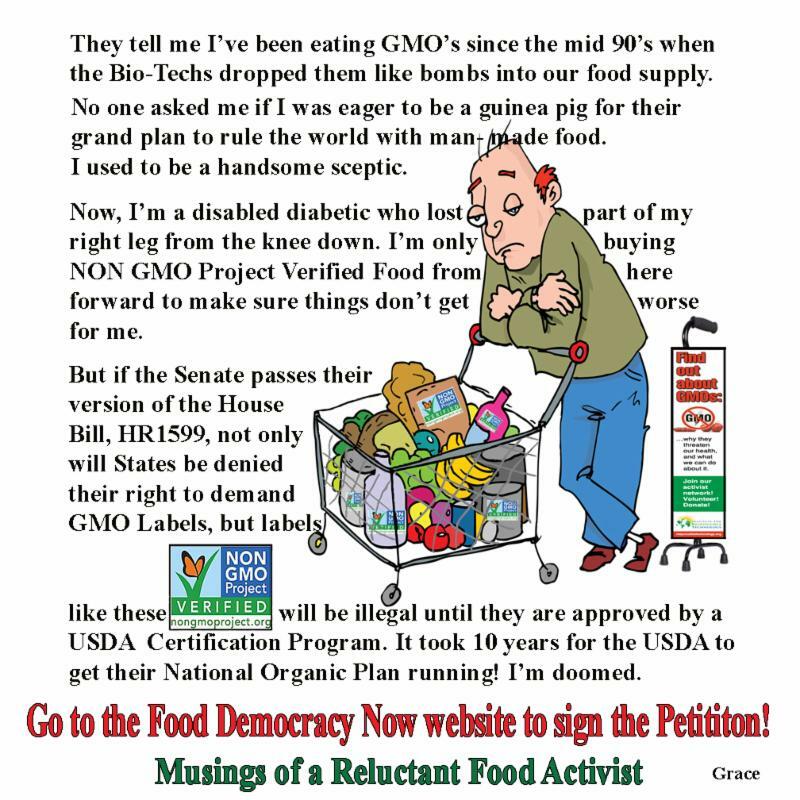 If your Representative voted AYE, he/she just chose the wishes of Big Food over yours. To read the Text of the “Safe and Accurate Food Labeling Act of 2015” go toGovTrack.US. We knew there was a lot of special interest politics going on in our government; but this revelation just blew the lid off of it. We really aren’t a Republic of the people when it comes to food legislation. We’re a Fascist State ruled by Big Food in collusion with Government. What’s so ironic about this is we’re the ones buying the products that these Big Food Businesses make. We are allowing them to turn us into sick, fat, sheeple who are being fed GMO’s just like the food animals they raise. The animals can’t speak for themselves; and now, if our House of Representatives has anything to say about it, neither will we. Big Food is not only turning us into mutants with their GMO concoctions, they are making us mute with their DARK Act. If this bill passes the Senate, we won’t be able to demand labeling via our State elections, and all of the products that now carry Non-GMO Labels will have those labels ripped off until the USDA gets around to issuing its rules and regulations that define, verify and certify what’s Non-GMO. The last time the USDA was tasked with this kind of project, regarding Organic Food, it took them a decade to get it done. So DARK is absolutely the appropriate name for this Act because the whole issue of GMO’s in our grocery stores will be delegated to a complete black out. So how did our food system get controlled by Big Food the Bio-Techs and the Government in the first place? There’s a revolving door between Big Food, the Bio-Techs and Government–a door that should be SHUT forever. Take Michael Taylor for instance. Michael Taylor has been playing musical doors between Monsanto, the USDA and the FDA for years. After working as Vice President for Public Policy at Monsanto, our President brought him into the FDA to be our Food Czar. A new and formal title was created just for him; and on January 13, 2010, he became Deputy Commissioner for Foods. Get in on the FOOD REVOLUTION and join the FOOD FIGHT! There are several Food Freedom sites that have grown up over the past five to ten years. This isn’t a new fight; but if it’s new for you, start paying attention. This is our health and the health of our children, our grandchildren and our environment that we’re fighting for. Go to the Food Democracy Now! website and SIGN the Petition to STOP H.R. 1599! Our lives depend on it. The Activist Post activates about a lot of things; but onepost Eric Blair wrote in 2010 about a hotly contested Food Bill, Senate Bill S. 510, the “Food Safety Modernization Act” tells the story of what’s really happening regarding food legislation in the U.S. WARNING! That Bill passed both houses of Congress and became LAW! It also had the word, “Safe” in its title just like the “The Safe and Accurate Food Labeling Act of 2015”. Oh, and please take note that S.510 was slipped into another Bill (that was guaranteed to pass) in the dead of night during the Christmas season on Sunday, December 19, 2010. The Organic Consumers Association is a real Take Action site. They have several ways you can join the Food Fight! Go to their website and start making a difference today. If you’ve been so activated by what our U.S. House of Representatives just did to our Food Freedom, this is the place to go to get your local food movement off the ground. The Institute for Responsible Technology is the home of the premiere food activist focusing on GMO’s, Jeffrey Smith. Mr. Smith wrote one of the most influential books about GMO’s way back in 2003. 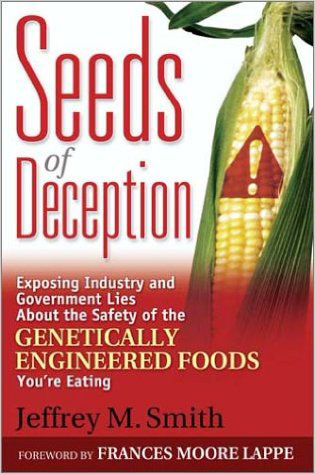 It’s a classic today and was one of the first books to expose the dangers of GMO’s to our bodies and our world. Get informed. Read Jeffrey Smith’s book. Check out the Take Action section on the IRT website. The famous food activist, Vandana Shiva is the center piece and originator of Seed Freedom. She travels the world sharing her views about the importance of preserving diversity and fighting against the take over of our seeds and crops by Monsanto and friends. These are just a few of the many food freedom websites that have sprung up over the years. Join them and Take Action with them. There’s still hope that together, we can save our food, our lives and our world. One last resource is a reference book on food. It’s The People Power Food Superbook Book 1 by Tony Kelbrat. Mr. Kelbrat has written an entire cadre of these reference books on various topics. This one has a Section on Food Activist Websites. 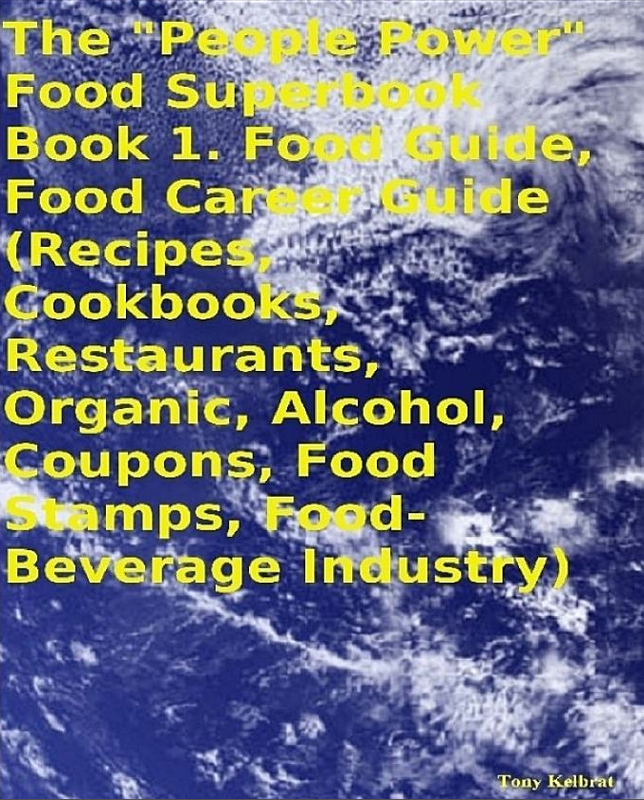 Granted, Mr. Kelbrat, uses a rather broad definition of Food Activist because Monsanto is actually on his list, and when we think of Food Activists we think of folks who are activating against Monsanto but nevertheless, this is a valuable resource. More About Monsanto and the relationship between Obesity and GMO’s. The U.S. House of Representatives in passing the HR1599 Bill, just gave producers of products containing GMO’s the right to put “Natural” on their labels; and Monsanto is actually claiming that their GMO seeds are organic because they only splice organic seeds. 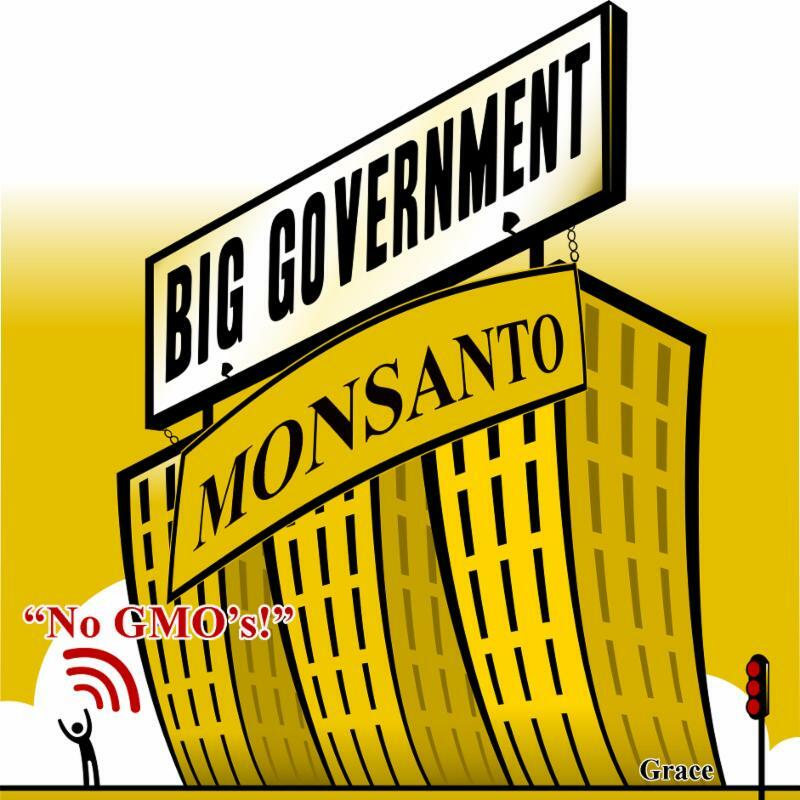 How long will it take for the NOSB (National Organic Standards Board) to be hijacked by this corporate giant and declare along with Monsanto that GMOs are organic. That will be the death knoll for the USA Certified Organic Label. But what is the relationship between the obesity epidemic and GMO’s? If you refer back to our May 2015 Newsletter, which is all about High Fructose Corn Syrup and its contribution to obesity, you’ll see that the culprit in HFCS is CORN. Now where do you think the corn in all of that High Fructose Corn Syrup is coming from? It’s coming from those GMO corn fields that now represent nearly 90% of our corn crop. So YES, GMO corn is contributing to obesity, big time. 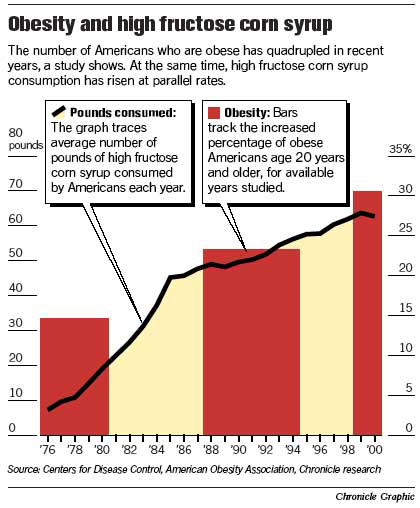 It isn’t an accident that just as GMO’s came into our food system in the mid nineties, the obesity epidemic began to take off; and once HFCS took over for sugar cane, the obesity epidemic got worse. Here’s the chart to prove it. Since the innocent fifties, when family farmers were our food growers and our waistlines were much narrower, the American Food System has experienced a hostile take over by Big Agri, Big Food, Big Chemical and Big Government. With a nod from the government, these companies are allowed to treat the animals they raise and the people they feed, the American people, with ruthless disregard. The recent passage of HR1599 by the House of Representatives is exemplary of that. We, the American people will have nothing to say about the GMO’s in our food if the Senate follows suit. We are being treated no differently than the poor, pitiful animals that have nothing to say about the deplorable lives they are having to endure under the highly questionable husbandry standards of the Big Agri companies. Isn’t it time for YOU to join the FOOD REVOLUTION. You can access all of our Newsletters here or just go to our Aquaponics USA website to access them under “AP Education”. There’s a 4 Part Series on the FOOD REVOLUTION to catch you up about this important and necessary movement in the U.S.
Coming in August! Part 5 of Obesity in America. Don’t miss Part 5 of the Series, Obesity in America. This is the longest Series we’ve written. 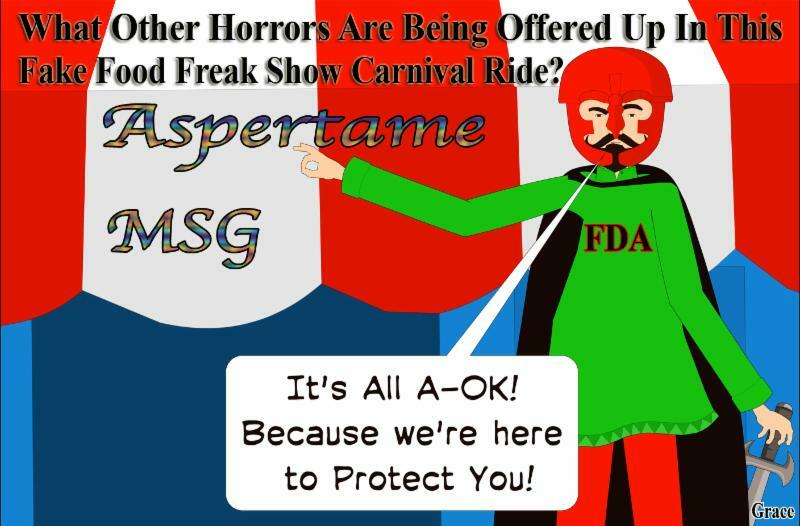 Part 5 is all about how Aspertame and MSG came into being, what they are, where they are and how terrible they are for our health. See you in August. There doesn’t seem to be a shortage of things to bring to the light of day out of our grossly mismanaged American Food System. 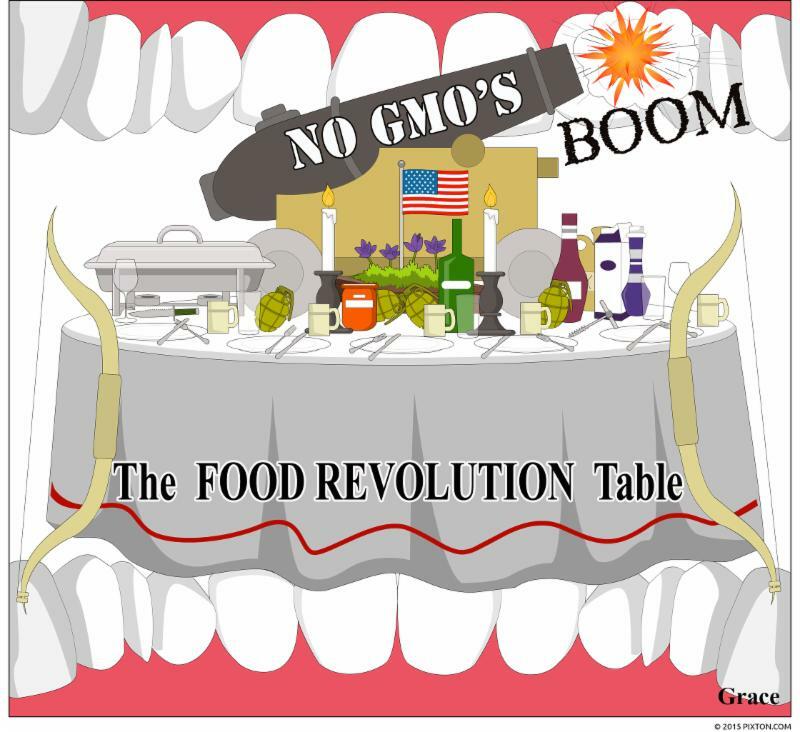 It really is time for a FOOD REVOLUTION in America; and learning Aquaponics is a big part of taking a stand for REAL Food. You can go to our Aquaponics USA website and access a 7-Part Tutorial on Aquaponics complete with Quizzes and a Certificate of Completion all for Free if you really want to learn how to be an Aquaponics farmer. Please alert your colleagues, friends and family who need to become aware of the dangers of GMO’s. We can’t make the changes we need to make without first understanding why the changes are so important. We can save lives with this information. Thank You for following our Blog. We so appreciate your interest in our two cutting edge Aquaponics Companies, Aquaponics US and Aquaponics Wold, LLC. We’ll continue to bring you important information about Aquaponics, our Food and our Food System, which, right now, is broken. Please help us turn the tables around and become the healthiest country on the planet instead of the sickest.